LEXIE CANNES STATE OF TRANS — As shocking as the headline reads, reality is even more disturbing — when one tallies up the yearly world-wide trans death numbers and divided by the number of days per year and you’ll get an average of three trans murders every five days, not nine. Last week in Badhber, Pakistan, police reported the death of an identified trans woman. She was found with gunshot wounds and visible signs of violence on Jan 22nd. Police believe she was killed elsewhere and her body dumped where she was found. Her body was sent to a funeral home. It is unclear if the police plan to make further attempts to identify the victim. 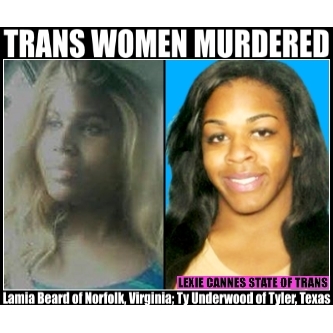 In Norfolk, Virginia, trans woman Lamia Beard died at a hospital from multiple gunshot wounds. Norfolk police say she was shot in the Park Place neighborhood. They say the investigation is preliminary and have no other information they can release. Note: News reports give contradictory dates of her murder — Jan. 17th and the 23rd. The HRC and The Advocate, for instance, have contradictory dates. In Tyler, Texas, police say Ty Underwood was shot to death on Jan. 26th. According to KYTX, police believe the victim was in or near her car when gun shots were fired. Although she attempted to drive away, the car got stuck. The police say they have a few leads and plan to process her car with hopes of finding additional evidence. Police have charged a suspect with first-degree murder in the fatal January 26 shooting of 24-year-old trans woman Ty Underwood in North Tyler, Texas, reports local news station KLTV. Carlton Ray Champion, Jr., 21, was charged on Monday after electronic and video evidence revealed that he was meeting Underwood for a date at the time she was killed. Police say that Champion, a student at Texas College, and Underwood, a nursing assistant planning to attend Kilgore College’s nursing program, had been in a “brief relationship” prior to Underwood’s death. LAS AUTORIDADES QUE HACEN PARA PREVENIR ESTOS CASOS. ????? well thats a dam shame who ever did that horrible act will pay one day.. This needs to stop. What would it take to stop these killings ?